We’d love your help. Let us know what’s wrong with this preview of Sleepover at the Museum by Karen LeFrak. Armed Imagine spending your birthday at the museum! Join Mason and his friends on their scavenger hunt through all the exhibits that make any natural history museum so special. The perfect birthday gift for museum lovers and adventure-seekers alike! To ask other readers questions about Sleepover at the Museum, please sign up. Mason and his two best friends are celebrating his birthday with a sleepover at the natural history museum. I will be the first to admit, I was a tad jealous. I've always wanted to sleep at the museum or library! Mr. Caffeinated and I love museums and made it a point to take our children Princess Sophia is the perfect age for Sleepover at the Museum and while Prince Clayton falls below the targeted age range even he got excited over the cover. Both children have a slight obsession with dinosaurs. Mason and his two best friends are celebrating his birthday with a sleepover at the natural history museum. I will be the first to admit, I was a tad jealous. I've always wanted to sleep at the museum or library! Mr. Caffeinated and I love museums and made it a point to take our children to them often. We even mapped them out when taking vacations. So it was exciting sharing this story with the Royals who already get excited by the local children's museum. 3.5 stars. "Sleepover at the Museum" is the story of Mason, a very lucky kid who gets to celebrate his birthday with his best friends with a sleepover at the local Natural History museum. A sleepover at a museum? Sign me up! Mason will get to go on a scavenger hunt and have the best birthday ever! This book was a lot of fun! We loved playing along at home as Mason and his friends discover a lot of really cool things at the museum. We have the fortune of having easy access to the Smithsonian Museu 3.5 stars. "Sleepover at the Museum" is the story of Mason, a very lucky kid who gets to celebrate his birthday with his best friends with a sleepover at the local Natural History museum. A sleepover at a museum? Sign me up! Mason will get to go on a scavenger hunt and have the best birthday ever! This book was a lot of fun! We loved playing along at home as Mason and his friends discover a lot of really cool things at the museum. We have the fortune of having easy access to the Smithsonian Museum of Natural History (when it's not closed by the government shutdown... ugh) and this book made for a good entry into talking about our own experiences at the museum as a family. The awesomeness of a scavenger hunt and sleepover at a natural history museum for a birthday celebration. When I had the chance to take part in the blog tour for this book, I knew I had to. Since it looks all kinds of adorable and fun. Feeling very thankful that I was able to take part in the tour and get an early copy of the book in the mail. I'm so glad I decided to read this book, because it was pretty great. Not perfect, but very adorable. Giving it four stars, as I liked it a whole lot, yet it was also not completely for me. My review will not be very long, since this picture book was so short, When I had the chance to take part in the blog tour for this book, I knew I had to. Since it looks all kinds of adorable and fun. Feeling very thankful that I was able to take part in the tour and get an early copy of the book in the mail. I'm so glad I decided to read this book, because it was pretty great. Not perfect, but very adorable. Giving it four stars, as I liked it a whole lot, yet it was also not completely for me. My review will not be very long, since this picture book was so short, but will be sharing all my thoughts about it even so. This book tells the story of Mason and his two best friends. It's his birthday and they are spending it at the museum. They are having an awesome scavenger hunt through a museum, filled with clues to lead them to the correct exhibit. I liked the clues a bunch and liked the story too. It was quick but pretty cute. Mason and his friends seemed adorable. And the illustrations in this story was so stunning. I loved the drawings so much. They were done well. Not too much writing in this book, but that was done well too. I enjoyed it. There is not that much to say about this book. It was short, yet good too. I wouldn't have minded if it had been longer as well. It's a small adventure book filled with great things inside of a museum. I really liked learning about the different exhibits there. I wanted there to be a bit more of all of it, but still. This story was fast and cute. I liked that the children were not alone in this museum, that a guide was with them, though not always in the pictures. It made it feel safer and more real too. Mostly enjoyed this book a lot. I must admit to having never visited a museum before. As I live in a smallish town and our museum is not very big and it is mostly about the history of our town. I must go one day, though. Because I do not know much about museums, I did not know it was possible to have a sleepover at some. Which happens in this book, and it was all kinds of awesome. At the end of the book it is shared where you can do sleepovers at museums. I loved that the information was included in the book. All kids should get a museum sleepover. And now I'm wishing I could have a sleepover at a museum too. As this book made it sound like so much fun. I'm glad I gave this book a try. Because it was pretty sweet and such a fast and fun read too. I loved the illustrations so very much, especially the ones of the museum animals. Sleepover at the Museum was a fun and quick read. A treasure hunt through the museum full of clues. I think that many kids will adore this book. Huge thank you to the publisher for letting me read this book early for free. I adored it a bunch. Clever book to introduce kids to Natural History Museums. Using a birthday party as a context, LeFrak takes the kids and readers on a scavenger hunt around the museum. With factually based clues, he readers learn interesting facts as they watch the characters try to find the perfect place to spend the night inside the museum. End notes list such museum and provide links to virtual museums. Inside covers provide simple floor plan maps. This book could be a good resource in classrooms. A mystery for the picture book audience as a scavenger hunt through a natural history museum allows for a romp through varied galleries and a search for the perfect spot to hold the sleepover. The list of museums and zoos that hold sleepovers was a nice touch. Cute story of a scavenger hunt and sleepover at the Natural History Museum. I loved the list in the back matter of museums where sleepovers can be held. A nice way to introduce kids to the fun and splendor of museums. Scavenger hunt riddles throughout a museum "tour." Fun fact with each exhibit. So much fun that my little and I are planning our first museum sleep-over. Mason and his two best friends enjoy themselves at a scavenger hunt at the museum of natural history while celebrating Mason's birthday party and sleepover. Fun and learning combined. Lots of kids will want to have a sleepover at a museum after reading this. Mason, along with his parents and two best friends, is spending his birthday by having a sleepover at the museum! Clues take Mason and his friends through each exciting part of the museum as they try to decide just where to spend the night. Sleepover at the Museum is a fun and delightful picture book! Karen LeFrak’s engaging storytelling will thrill little readers as they excitedly join Mason on his museum adventures. 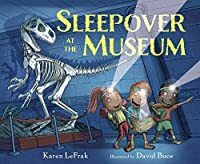 Through crafty, clever clues, LeFrak wonderfully lays out the museum and intro Mason, along with his parents and two best friends, is spending his birthday by having a sleepover at the museum! Clues take Mason and his friends through each exciting part of the museum as they try to decide just where to spend the night. 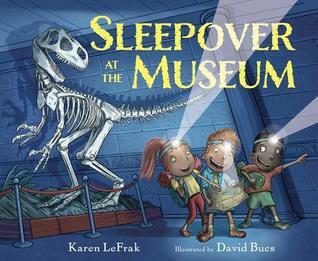 Sleepover at the Museum is a fun and delightful picture book! Karen LeFrak’s engaging storytelling will thrill little readers as they excitedly join Mason on his museum adventures. Through crafty, clever clues, LeFrak wonderfully lays out the museum and introduces readers to so many fascinating topics, from dinosaurs to geology, butterflies, the ocean, and more! David Bucs bright, lively illustrations perfectly bring the museum to life and capture all the fun Mason and his friends are having. Little readers will enjoy pouring over each page and spotting all the cool details. I really want to like this a lot more than I do. The end pages are way cool looking and I really like the idea of a book that encourages love from museums. I also like the idea that the kids can solve the mysteries, but overall this doesn't really flow well. Also, just, a bunch of extra kids show up at the end out of nowhere? What?